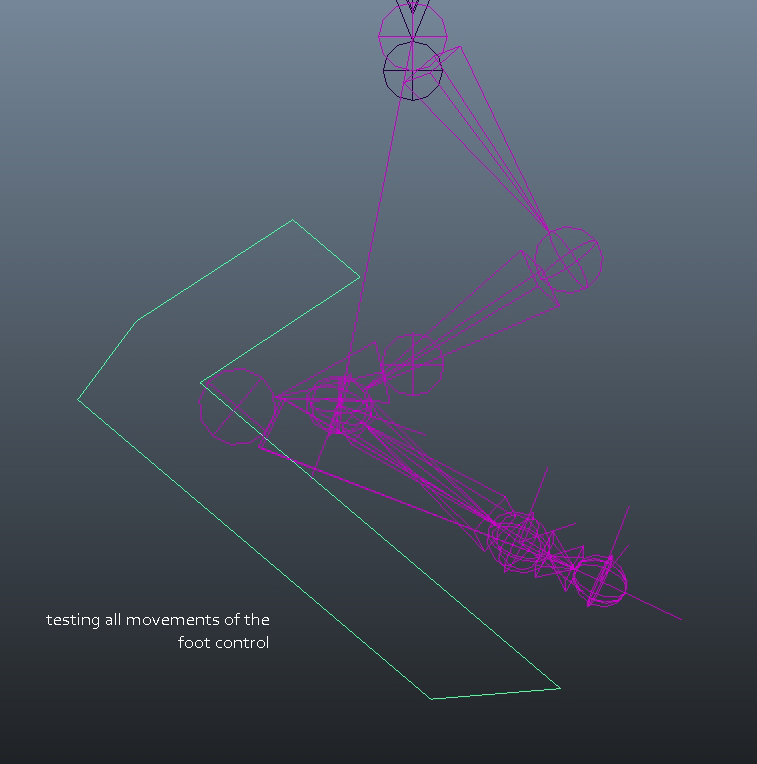 I am making a reverse foot setup to have a separate control for lots of different foot movements with a broken hierarchy to achieve it. 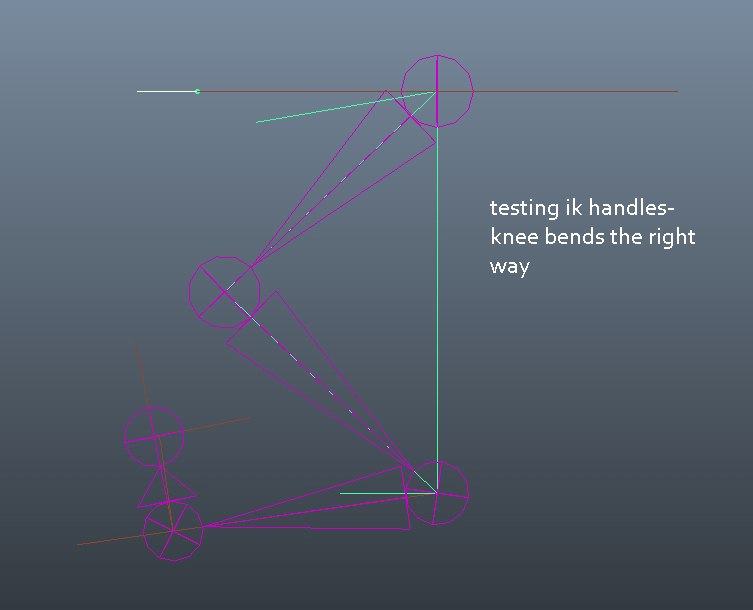 The first set of joints are the IK leg setup for binding. These will need to have standard orientation to match the other joint systems and stay consistent with the rest of the rig. Set up the leg IKs. 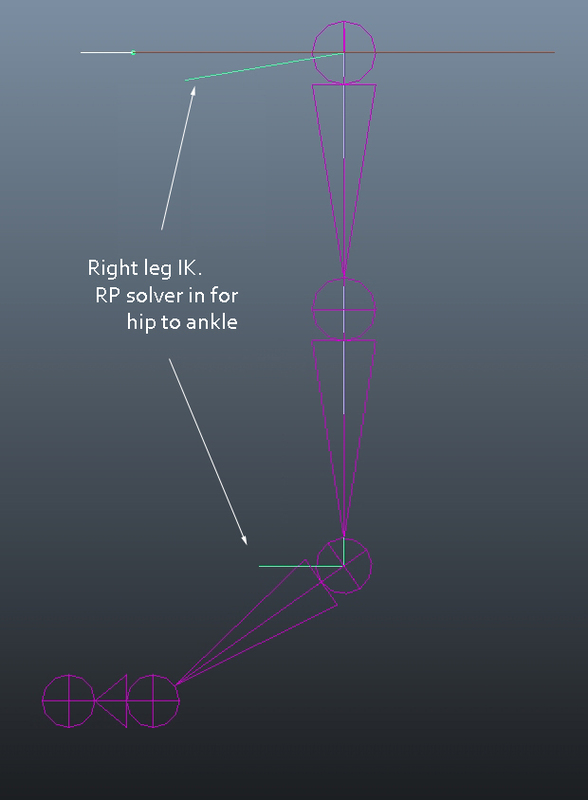 RpSolver is used because extra rotation controls and a pole vector for the knee are needed. 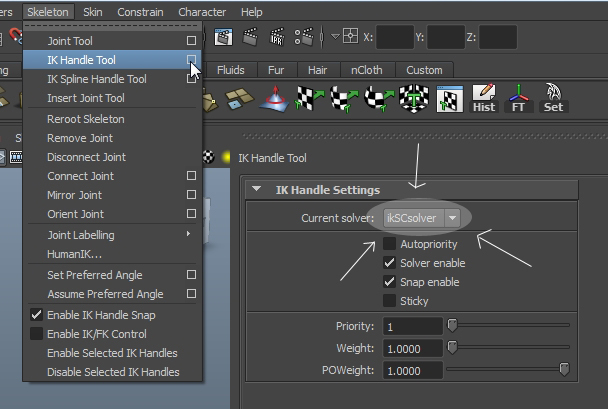 RP solver allows for twist and rotation in different ways. then select the hip then ankle joints. SC solver is used when only ordinary rotation is needed, no extra twist or rotations, and when going between just 2 joints. select the ankle then ball joints. Repeat with the ball then toe end joints. Test by lifting the foot to see if all bends the right way. 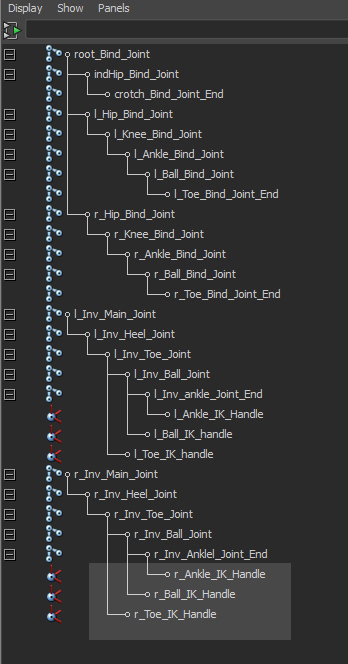 Building reverse joints… this is done so that there will be extra pivot points and sticking points for the foot with a separate hierarchy for them. Rotations and twists can be controlled for just the foot joints with the ankle being the base of the movement then heel then ball and toe like a real foot. To build the new joints- locators are made at the exact location of the original joints, adding one for a heel joint, so that the new joints can be snapped to them. Because higher joints in the hierarchy will move all the joints below the new joints are V snapped to the locators by starting at the top of the hierarchy . The reverse joints are built with the orient set to world space so that their movements are based on their place in the world because that is where they move eg in relation to the floor. These steps are described below. create another and v snap it to the back tip of the foot on the model at the height of the other joints. 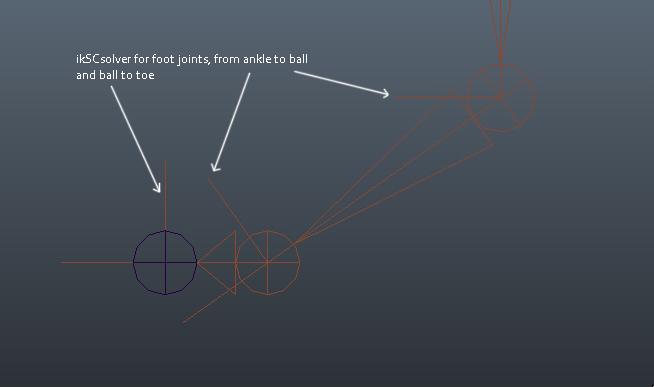 Create joints starting at the ankle joint then go to the heel then toe then ball then ankle again. Name them eg: r_inv_Main_joint; r_inv_Heel_joint; r_inv_Toe_joint; r_inv_Ball_joint, and r_inv_Ankle_joint_End. Put them in a layer and name it inv_Joint_layer. Check their orientation and set to world if not already. 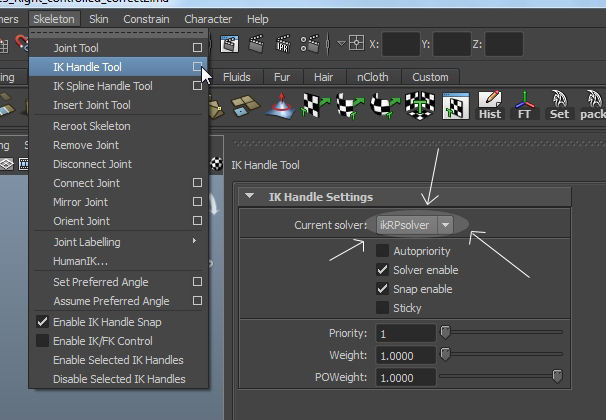 Parent each IK handle to the its matching joint in the inverse system. To control all the foot joints a foot control is made and pivoted at the ankle joint so that the movements of the curve will move the foot centred at the ankle joint, where it would in a real foot. 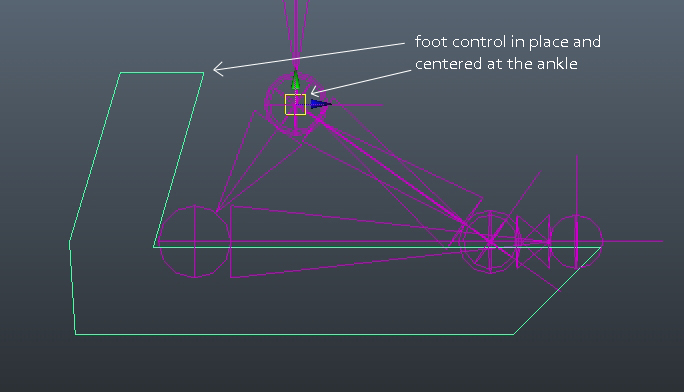 create a foot control using nurbs curve with the EP curve tool with the options set to linear so it will have straight angles if that’s what you want. V snap the curve to the foot and centre its pivot at the ankle joint. 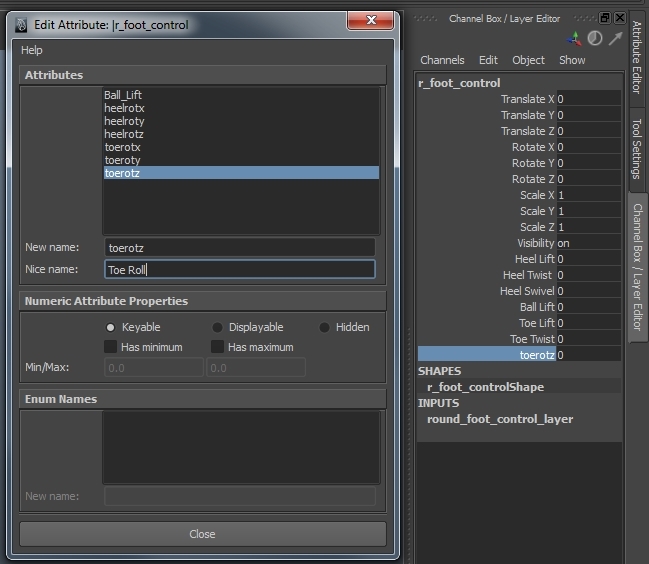 Select the foot control then the inverse main joint and parent control. 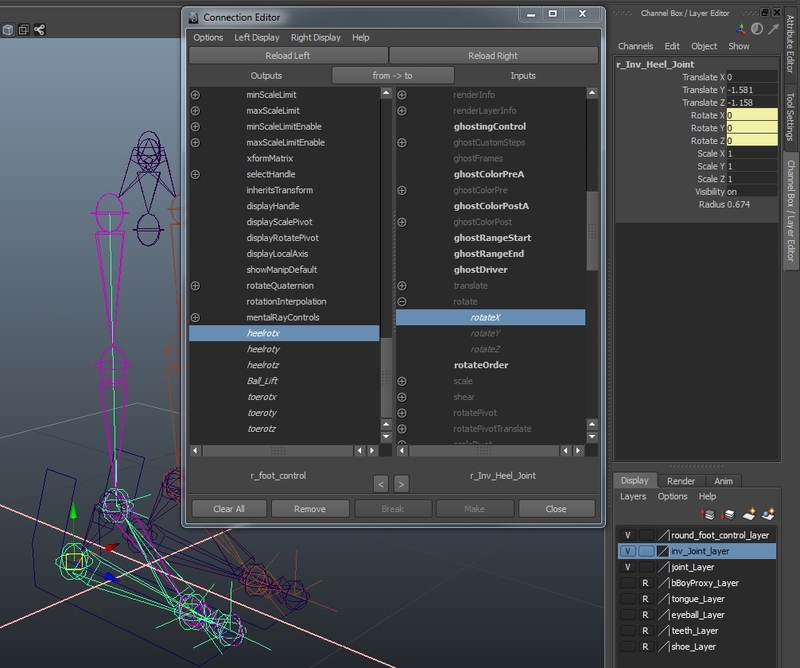 Adding attributes so that new movements can be added to the control. Only 1 is needed for the ball joint because the ball joint only rotates in 1 direction. Add the most used ones first so that they are on top. Then they will be in the channel box for the foot control. repeat for each one . For the ball joint just add the 1 to lift the toe. 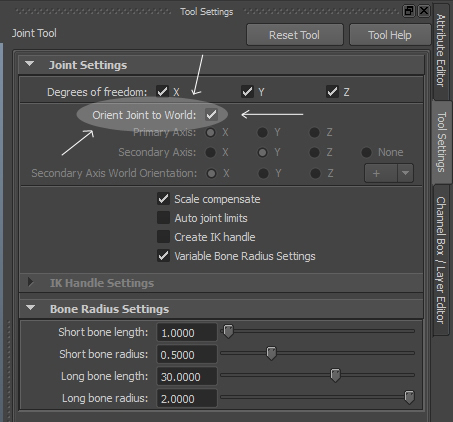 Connection editor connects the new attributes of the control to the selected movements of the inverse joints. on the right side scroll down to about halfway and find rotate and click the + sign to expand it. Click heel rot x on the left (when heel is on the right side) and the rotate x on the right side to connect them. 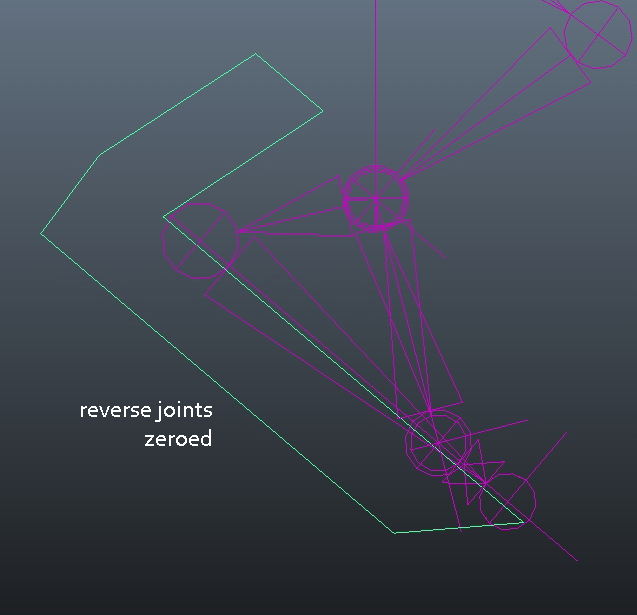 repeat process for each reverse joint. 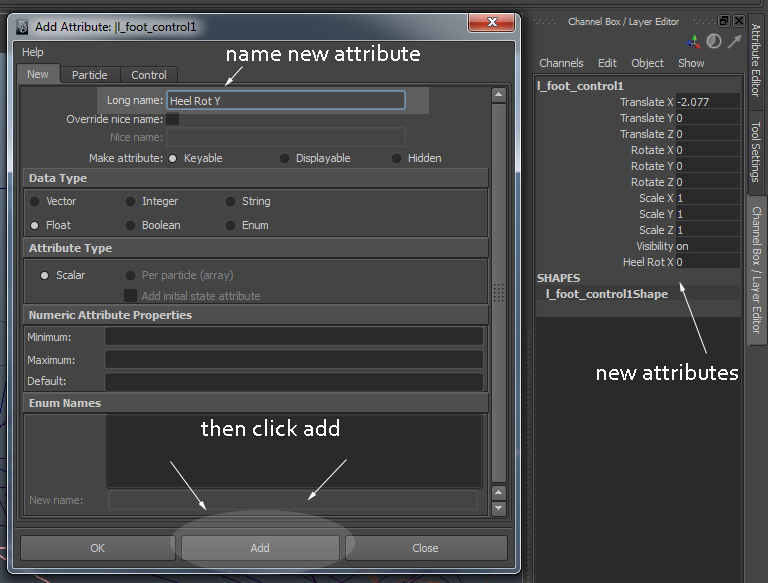 Edit attribute- You can change the names of the attributes to be more descriptive so it is easier to understand for the animator. Click the names 1 by 1 and write the new name in the place called ‘nice name’. eg change Heel Rot X to heel lift, Heel Rot Y to heel twist, Heel Rot Z to heel roll.